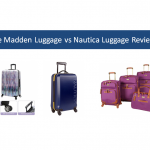 Between Lucas Luggage and Travelpro Luggage there is already a set brand stigma and even a familiar design factor which will typically make most major travel enthusiasts opt for one (Travelpro) over the other. This is because Travelpro is a 20-year brand typically seen as the choice for flight crews; it was also one of the first brands to introduce rolling wheeled luggage. 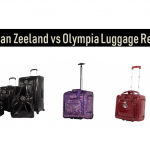 However, Lucas Luggage has quickly become one of the best lightweight options for the avid traveler, and we think in the next five years you’ll be seeing more Lucas luggage in those overhead compartments. Don’t just take our word for it, instead take a look at these brands for yourself. Unless you work a flight crew job and move airplane to airplane on a never ending continental journey – typically attendants and pilots – Travelpro luggage may not be the choice for you. The reason flight crews are seen choosing this brand is often because of its easy wheeled portability with a harder and heavier protective frame (typically made from light plastics or stiff nylon fabrics). They also choose these bags for their multiple easy-access compartments and because some airlines require their employees to purchase the Travelpro brand for its sophisticated ‘nothing-but-business’ look. It’s a brand known for harder frames yet a more compact design – easy to pack, quick to move around, and easy to store. The Lucas brand, on the other hand, typically features luggage with a lightweight satin-polyester design. These bags are expandable and their final weight depends more on the amount you pack than the original weight of the bag – making different airline weight requirements easier to meet for the frequent flier. These bags also need less weatherproofing on the outside because of their fully padded and lined interiors. Like the Travelpro bag, this brand also features 360-degree spinner wheels and a telescopic handle, but the Lucas brand’s main advantage are its natural lightweight design and reduction in common travel pain from luggage weight and flying. Travelpro. A non-expanding polycarbonate hard-shell carry-on bag from Travelpro has interior dimensions of a 21-inch length by 14-inch width. A medium sized Travelpro bag has 51 liters of packing space; these typically weigh somewhere between 5 and 6 pounds before being packed. They tend to lack inner large or zip pockets, except for one long sleeve built into the lid of the suitcase – great for shoes, jewelry, and bathroom products. Additionally, all their hard-shell designs have been tested by a phenomenal Quality Control Lab which runs extensive tests to check the damage done to clothes, electronics, shower products, and breakables during accidents such as hard impacts. Each bag you buy from them can be assured to handle everything your travels will throw at it. You’ll be able to pack less with the drawback of a heavier weight, yes, but at least you’ll know that each time you fly with a Travelpro bag, you can guarantee the protection for whatever you store. Lucas. In North America this luggage brand is most popular for its impressive storage in such a lightweight frame. These bags are known for being easily expandable – made with strong but stretchy nylon and high-quality fabric materials, as well as some plastic elements – to compensate for any extra baggage you purchase on your travels. These suitcases typically lack inner pockets, though what they lack in inner specific storage they make up for in exterior zipping pockets – great for storing travel documents and protected laptops. The interior dimensions of most expandable carry-on bags from Lucas Luggage also give the standard 21-inch by 14-inch space, with the added benefit of an extra layered and padded roof which can expand to allow you more packing room. A medium sized Lucas bag is rated for around 69 liters of packing space. This is a hard-shell bag and along with a smaller selection of hard plastic and nylon bags is a common example of Travelpros catalog. This bag has the exact same inner storage dimensions as the below Lucas Luggage suitcase. Unpacked, this hard-shell bag weighs 5.6 pounds. Its original sale price was for $280.00 when it first entered the market, though now it is much lower from select retailers on Amazon ($150.00 or less). Travelpro also offers a lifetime limited warranty on all their luggage, which may make any purchase with them well worth the money. This expandable lightweight bag, often part of a three-piece set, is a typical example of Lucas’s catalog. Its inner storage dimensions are exactly the same as the above Travelpro example, with the small advantage of having an expandable fabric roof which allows extra room for more packing. Unpacked, this expandable suitcase weighs 5 pounds. It’s original market price when it first came out was $200.00, though now it is available cheaper from select retailers on Amazon (closer to $60.00). Lucas Luggage only offers a 5-year warranty on their products, and although this is much shorter warranty than with Travelpro luggage, it’s because the Lucas brand is known for making luggage that’s more affordable for the common middle-class consumer. Travel pains typically tend to be in the back, leg, and neck areas. These pains are a combined result of frequent walking and even running – while trying to catch a flight – while toting a heavy suitcase, lifting a carry-on into an overhead compartment, and pulling the same carry-on out after the flight has completed. For their lightweight designs, 360-degree spinning wheels, and soft easy-to-lift exteriors, the best brand for alleviating common travel pain is the Lucas brand. Travelpro bags are easily more weatherproofed than most common brands on the market. These bags typically feature hard-shell designs specifically made to thwart handling damage as well as weather and water damage. Even Travelpro’s non-hard-shell bags are manufactured with layers of thick lining and a strong outer plastic shell. This will typically depend on the bag you choose rather than on the brand you choose, especially considering that both of these brands do try and provide other options to their customers who don’t only want a hard-shell or lightweight design. Travelpro also has a medium selection of lightweight bags with multiple outside pockets, telescopic handles, 360-degree spinning wheels, and fabric textures. Just as Lucas offers some great hard case carry-on’s with superior ABS materials and safety testing against handling and flight damage. These are both great options when it comes to the extra features their brands offer. You as a traveler will have to decide what type of case you want based on how it will best suit your circumstances. Travelpro has an excellent record and is a reliable brand name through which to purchase all of your luggage with a reliable warranty and trusted design every time. As you can see though, it’s a brand typically know for bulkier bags made from heavier materials with a higher purchase expense. Therefore, it’s our suggestion that the common middle-class flier traveling on periodic business or vacation would most benefit from the low cost and easy use of a Lucas Luggage case. These bags tend to be more lightweight and easier to store in overhead compartments than their competitors, and they’re also typically more expandable and give you leeway in your packing before or during a trip.